Lake Falls drops 40 feet from the top of a dam to the floor of the canyon. 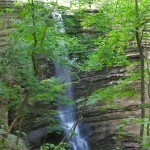 On the canyon floor, gingerly step through a mix of sandstone, rock, and mud to get a better view of the falls. 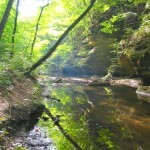 Mosses, liverworts, and ferns grow on the damp, shady, 30- to 40-foot walls of the canyon. 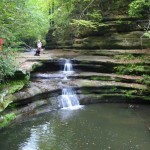 Solid sandstone channels the stream over a small waterfall that empties into the pool called the Giant’s Bathtub. Geologists say these pools develop and grow larger by the action of rocks and pebbles getting swirled around. 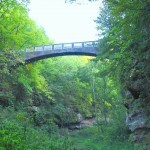 The stairs, footbridges, dams at the park were built by a local industrialist who created the park as a private refuge for his family and friends. The walls of the canyon are sometimes smooth and flat, sometimes rough and pitted. 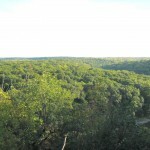 Visitors can hike to the southern section of the park where they’ll have big views of a river valley. 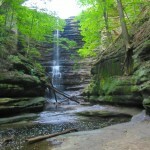 Learn more about hiking at Matthiessen State Park in 60 Hikes within 60 Miles: Chicago. Buy the book on Amazon.com or pick up this individual chapter on Trails.com. Prairie Fever is powered by	WordPress 3.5.1 and delivered to you in 0.267 seconds using 32 queries.